Rated 5 out of 5 by Majestyx12 from Stratford Halloween Party Twin sisters Marianne and Regina come together for a Halloween costume party. People turning up dead, ghosts and the festive Halloween goodies table. I love it. I chose the white gown for Regina. The hops are lovely and most of them have morphs in them. I like collecting the witch on a broom. This maker has replays on hops and mini-games and Souvenirs. I want to know the end of the mystery. Rated 5 out of 5 by Valdy from Spooky Halloween !! The two game genre I enjoy most playing are Christmas and Halloween. And here is a Halloween game very much to my liking. I like pretty much everything about it: the characters, the time period, the colours and graphics as well as the gameplay. A must buy for me. Happy Halloween !! Rated 5 out of 5 by sunnyglow from UNMASK A KILLER AT A HALLOWEEN COSTUME PARTY REVIEW BASED UPON THE ENTIRE GAME 4 Chapters Plus a Bonus Chapter – Strategy Guide: 36 Pages OVERVIEW: As Halloween approaches - get ready for a Halloween costume party, EIPIX-style! As the new Mrs. Stratford, Regina, you are hosting a Halloween party with your fun-loving twin sister, Marianne. However, when you switch identities at the party, your twin disappears. Murder and mayhem will be on bill for tonight’s entertainment as a masked maniac is on a rampage. You, as well as others, believe you are seeing the ghost of Caroline, your husband, Eliot’s first wife. A note from Caroline indicates that she is out for revenge against your husband. Is the ghostly presence of Caroline behind your sister’s disappearance and the murder of several guests, or is there a living person involved? OPINION: This is another frightfest to get you into the Halloween spirit. For me, this is one of the best EIPIX games to appear lately. This is a fantastic murder mystery with a well-written gaming script. The pace is excellent with plenty of activities to keep you busy as you romp around the mansion searching for clues as to the identity of the evildoer. The scenes are all decked out for Halloween oozing with pumpkins along with witches, skulls, and other Halloween paraphernalia. Kudos to EIPIX for a frightful little Halloween romp! This whodunit will keep you in suspense to the very end! MECHANICS: There are four (4) levels of play including a customized version. There are eleven (11) achievements. Collect thirty-five (35) witches and eleven (11) morphing objects within the HOP scenes. After the game, collect twenty (20) souvenirs. I found most easy to locate. You must locate all the collectibles to search for the souvenirs. You can replay seventeen (17) puzzles and fourteen (14) HOP scenes. There are eight (8) wallpapers along with casual art and music and video selections. BONUS CHAPTER: It is neither a sequel nor a prequel. It is a segment of the game not addressed within the main game. Play Marianne in this game. To reveal more would spoil the entire game. I was disappointed in this chapter. I found it a boring time-filler with very little action. It is slow-paced consisting of Marianne meandering around the scenes without any communication with any of the other characters until the end of the game. There are only three (3) HOP scenes which are lists of items and only four (4) puzzles within this chapter. For me, this extra chapter is not worth the extra price of the game. HOP SCENES: There are twenty (20) scenes within this game. The scenes are a vast improvement for EIPIX. There are some creatively designed ones which I will replay. They include lists of items and silhouette scenes in some ingenious settings. There are no storybook scenes which elated me as I have grown weary of these. There are a few scenes in which you must rotate items within the scene to connect two halves to complete an item to be removed. My favorite scene is one in which you must rotate potion jars to combine two halves of an object to be removed. There is a search-and-replace scene in which the player must search for items on three scenes as seen through a keyhole and then replace them back into the scene. In another you use a variety of colored lenses to search for items in different scenes. PUZZLES: The puzzles are excellent as well! There are twenty-one (21) puzzles within the game. The are varied in style and difficulty. There is no choice in the difficulty of the puzzles; however, there is one maze puzzle in which you are asked if you wish help or not. There are a couple of logic puzzles which I enjoyed playing. SPOILERS: HERE IS A SAMPLING OF SOME OF THE PUZZLES AFTER THE DEMO: A. Line ‘em’ up! Logic puzzle. Move coins on a grid so all are placed according to given coded directions. You must decipher this code to assess where each coin is located. B. Place your bet! Pumpkin race. Place pumpkin shaped carriages on a track to locate the fastest three (3). C. Itsy Bitsy Spiders. Lead two spiders to the top of a web by maneuvering the lines upon the web to help them reach the top. Pull on a cord to check your work. D. A-maze me, you old bat! Maze puzzle. Lead a bat through a 3-dimensiontal maze which moves up, down, and sideways using arrows to guide its path. When you reach the end of the cube, by pressing an arrow, it will open a new side to continue the maze. E. Help or no help! Maze puzzle. Move through a labyrinth from beginning to end using a map. You can decide to get help or not with the map. F. Domino Puzzle. Place dominoes in a grid so that each end matches up with the domino next to it. BONUS CHAPTER: G. Feet of clay. Assembly puzzle. Two-step puzzle. First assemble a family crest and then color it in with colored clay according to a given diagram. H. You light up my life. Connection puzzle. With only eight (8) matches, connect torches to create a path from start to finish. Rated 4 out of 5 by J9CT from Despite Bad Reviews, This Is A Good Game!!!! I'm not sure why all the bad reviews though. Mode: Various game modes and a custom mode which is my favourite. Storyline: I enjoyed the storyline and the characters' conversations added to the game and story. You can hurry the conversation on if you don't want to listen/read everything. Graphics: Beautiful and interactive. I realised that it was a Halloween themed party and that the game isn't necessarily spooky, I think I confuse those sometimes as I'm always looking for spooky when a game has Halloween in the title. Also finding achievement items was not easy at all, they're not in full view like other games which makes it a nice challenge. 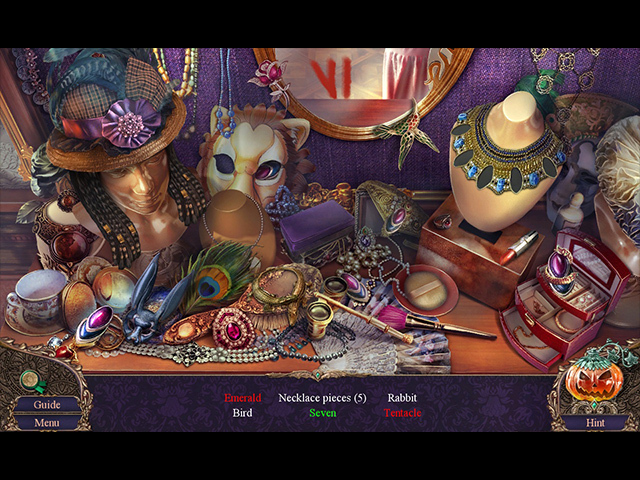 HO & Puzzles: I always enjoy hidden object scenes and there weren't too many or too few. Some puzzles were very easy and others I had to skip as it was too difficult. Those that I did play I really enjoyed. Bonus Chapter: You get to play another character which you interacted with in the main game and you play from their point of view which is a first for me and a really nice change. Bonus game was very short though. Definitely try this game despite the reviews as it gets better further on into the story. Rated 4 out of 5 by RPgames from Halloween time I like the game. I like the bonus chapter better but it was short. Not spooky but an old fashion murder mystery like Agatha Christy type game. You do go around finding items through out the game but that is what I expect in a hidden object game, I don't know why people complain about this. That is why they call it 'hidden' object not stand there and things jump out and fall in your hand game. Good game for some one who wants to use your mind. Graphic's were very good with voice acting very good also. Not a five star game because it was not very suspenseful most of the time . Rated 4 out of 5 by aqcheryl from It could have been more challenging The graphics were excellent, the game play was fun. But the story felt rushed, and lacking, the puzzles were far too easy and completely unchallenging. It feels like this game is geared towards adults, but the puzzles geared towards children. The bonus gameplay is not a prequel or a sequel, but rather a different POV of present events. You can collect signs on every scene of the game (witch on a broom), but having all of them didn’t seem to unlock anything? Rated 4 out of 5 by GoneFishin86 from Whats with all the negativity? The game was entertaining the mini games were challenging and i found the mystery to be engaging. I personally loved the mini games that had the lists of clues to determine where you set up pieces on a board and there were a few like that. I am not quite sure why this game got so many one star reviews but I played the whole thing and ironically my only complaint is that it is way way too short. I mean if the game sucked I would have been stoked on the short game play. Rated 4 out of 5 by eric72 from Not perfect but entertaining Of the 3 HOPA games released for Halloween this year ( the 2 others are Halloween stories and Halloween chronicles) , that is the one i liked the most , Uninvited guest is far from being perfect but at least it is entertaining and gave me the will to play until the end. The HO scenes are too easy but some are presented with creativity and likewise the mini-games are rather easy but a few are interesting to solve. And of course we want to know who is the murderer as we explore this three floors mansion and a crypt at the end. The bonus level is not that long , done in 40 minutes , but like the main game it was pleasant to get through , we play from the main character' sister point of view while a part of the main plot is unfolding. I did not expected much given the low rating , but i had fun when playing. Rated 4 out of 5 by riverdiver from Great invitation to attend THIS Halloween party! But - I’ve learned my lesson. From now on I’ll stay away from Halloween parties in real. Completing the game was great fun though, it’s a replay before next Halloween. The preparations for the party, choosing a costume, making a seating plan and who eats which dishes, were a bit slow in my opinion. The occasional appearance of the ghost of the first wife of the Player Character’s husband, Eliot, was not really scary. But then pace was picking up and up. So did the chill and spook factor. The house, its decorations, the sumptuous finger food, the characters, the atmosphere, I couldn’t stop playing, in spite of flaws in the story. I didn’t quite get why so many people were killed. Well, if it goes wrong it goes wrong. But the smooth gameplay, the great puzzles and, for me most important, the fantastic HO scenes helped overlooking this. The HO scene where you had to turn the glasses with the candles was just brilliant. Or the scene on the balcony where you had to find leaves with certain marks. I replayed all the HO’s several times, enjoyed them so much. The Bonus Chapter was an absolute treat and reason to give four stars. We go back to point of the story and play as a different character. It was packed with action and fun! And it made me realise that I, as the Player Character, have been playing the main game dressed as Marie Antoinette. Not quite the attire to face ghouls, to rummage a substantial manor. Hats off! We’ve done it in style! Rated 4 out of 5 by gobaba from Excellent graphics but story falls flat Based on main & bonus games Eipix wowed me with their rich scenery detail in a plush manor. Quite stunning! Music, environment, minimal chatter, and attractive atmosphere were all pluses. Voice overs were a bit squeaky, as far as the women. Storyline was rather bland for a Halloween game. HOs showed a lot of new themes and had good variety. Puzzles were recognizable, though some were new and challenging. Adventure level was very good. Morphs are in some HOs, and collectible witches in every scene. CE bling includes replayable HO/puzzles, a souvenir room (collectible hunt), and the usual. Main game lasts about 3.5 hours, bonus is about 40 minutes. The bonus game ties directly into the main game, played from a different character's POV. I was sorry the game was short. Is it worth a CE? Nah, the main game is the best part. Unless you can't do without CE bling, the SE would be great. Rated 3 out of 5 by Monkeygus from Another short one to waste money on There are things I liked and things I didn't like about this game. I liked the graphics and the ghostly image of the former wife in the story. The voices were annoyingly British (or at least some of them were) and some of the graphics showed lip movement and some didn't (Make up your mind Devs!). The puzzles were standard fare and fairly easy. I think I looked at the guide once to make sure I was on the right track. The morphs were odd because some of them were large. The collectable witches were easy to spot. The main story was soooo short! They had a good story going and ended it too fast (even if the "villain" was an easy guess from the start).The bonus game almost made up for the shortness of the main game, but it was basically more of the same old, same old. This story had very little to do with Halloween except that a Victorian Halloween party was suppose to be going on (with 3 guests??) and there was a friendly ghost appearing when needed. Don't waste your money on this one. There are better Halloween games out there. Like always, try the demo first, but just know that the demo is about as good as it gets in this game. Rated 3 out of 5 by conja from Not a riveting game The game started out great! Got my interest piqued so I bought the game under the special price. I was finished 2 hours later. I thought the storyline could have been a lot better. The map works great. The video and sound effects were okay. There's just not a lot to say. I've definitely played better games. Is it my imagination or are Hidden Object games becoming repetitive and few and far between? Rated 3 out of 5 by judy76073 from on the fence with this one...... so, I am on the fence with this game. I've played about 1/2 hr of the demo. It is OK, but nothing to write home about. If the game doesn't "grab" me in the first 10 minutes, I won't buy at full price. will wait (perhaps) until there is a good sale for BFG members at a good price, then maybe will consider purchasing it - if only to have a new game to play. It is disappointing that there's only 2 days a week where HOPA CE games are offered - Thursday & Saturday. I realize there are many different genres of games out there, but at least, would be nice if a better sale can be offered to BFG members on Thursday's releases. On the whole - not a bad game, but not one that I would pay full price for. Will just have to re-play older games (yet again). Rated 3 out of 5 by MaryEl from Haunted Manor: Halloween's Uninvited Guest I do like the game, however most of the time the objectives are not very clear. Mostly a guessing game on my part to see what I am suppose to be doing. Rated 3 out of 5 by jaylake from Feeling Let Down Again a CE edition that started to look good. I am not one to go in depth but my main issue is that this is really only a three chapter game. First two lengthy then two only three pages long. This is simply not worthy of a CE price. The game voice overs are unconvincing and all in all I found the game quite boring. Rated 2 out of 5 by middleagedmale50 from Boring manor I deleted this after 10 minutes. A lot of yak yak. No offense to women but this is a very female oriented game and I am not a woman and I cannot relate to this. Plus, it is boring with no interest to keep me playing. Especially trying on dresses. Not for me. Rated 2 out of 5 by RasmusB from Another boring and unnessecarily complex Eipix game I'm getting very tired of these overcomplex, and thereby boring, games from Eipix, and this is no execption. Bad graphics as usual, and a LOT of uninteresting things you have to do, besides the fact that, this has NO halloween atmosphere to speak of as yet. I haven't played very long, but so far it so boring that I simply cannot play this to the end. The story line, however, is better than usual for a Eipix game and the voice-acting also, but I cannot make up for dated visuals and boring gameplay. Rated 2 out of 5 by notbarb from Not recommended Was irritating from the start. For me there was no continuity. It made so little sense, I couldn't tell what to do next. Graphics and storyline good. Rated 2 out of 5 by dancemom1 from Yawn! Hello friends! Here we are with yet another Halloween game. The lead into the story was quite well done, but then seemed to fall off short. Graphics were very blurry, but when the game actually started, they cleared up some. However, they were still not very clear. Colors weren't too bad, some faded, others quite clear and nice, depending on where you were in the game and what was happening. Voices were pretty well done, except some of the men sounded like they were bored with the whole party and ready to leave. Sound FX left a lot to be desired. In other words, not much. Very disappointed in the lack of animation. Any movement we had was quite stiff. HOPs were the usual straight lists and some interactive lists thrown in. Did not see that you could switch to something else if you got bored. Scenes were fairly clear and items were not difficult to find. We did have a morphing item in each HOP. Puzzles did have some challenge to them, but nothing new or difficult to complete. Our map was quite boring, but it did jump us to another location, if we could find the right place in the picture to click. I did note that, even though there was something to do in a particular location, it was often locked and we could not go there until it was "time" according to the game. Hint system was mostly helpful, but I did run across one of those "I suppose I'd better move along" notices. Fortunately, we have the transport feature in this one, so you don't have to mess with the map. Collectibles were very disappointing. All I found are 35 witches riding on brooms. These all looked like flat plaques, and they are plenty large enough to see. Definitely needed more. In keeping with the Halloween theme, this is another one of those all too familiar who done it and why type games. The demo was very short, but I found that the story is not new and doesn't flow very well; there is no real action except for our ghost now and then; and we spend a great deal of time running around and not really accomplishing anything. This story was slow and boring for me. I'm sure there will be those who find this fun, but not me. I will recommend this one for beginners, but not for experienced gamers who want some real challenge and excitement. No buy for me. As always, try it for yourself and see what you think. We all have different tastes in games and you may find this one to be exactly what you are looking for. Thanks for the reviews. Play on! Rated 2 out of 5 by Darklldo from No, not good Far too much talk and very little action. The 'excitement' in the voices is irritating - very high pitched. The game moves slowly and there is little of interest happening. The challenges are mediocre. I didn't last the hour, I felt I was wasting time. Rated 2 out of 5 by jennsmom from Call the police Very long introduction that is supposed to provide back story, but doesn’t do anything of the kind. One male character who is the one who introduced the husband and wife comes along – but no further info given. Nobody thinks of calling the police when it's obvious police should be called. One ridiculous puzzle involving pumpkins to find a key, and also - the dreaded Dolly Dress Up.There is no apparent reason that first wife is haunting the place. Extremely illogical progression. Played for about 15 or 20 minutes and had no fun at all. Huge disappointment. Rated 2 out of 5 by biscuitsmama from A HALLOWEEN PARTY I WILL NOT ATTEND AS I AM VERY HAPPY TO PASS ON THIS ONE! 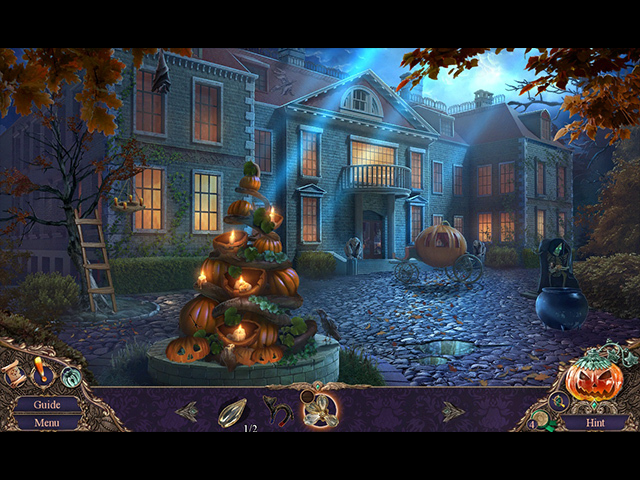 Haunted Manor Halloween’s Uninvited Guest is the 5th game in the series and is the 2nd game developed by EIPIX. At one time I could not wait until the next Haunted Manor game was released as the first ones were so terrific, but now they don’t hold the same appeal for me as they once did. Technically, the game has all of the wonderful features that we expect from this developer but I found the graphics to be misty in appearance, lacking the same quality of the original games. The storyline is one that has been done over and over and over so there is nothing new here except for the “window dressing.” The storyline would have been okay except that I am fairly well over the Halloween theme of every HOPA game since September. I guess that the old saying of “less is more” is true because the over-saturation of Halloween is a bit over the top for me. 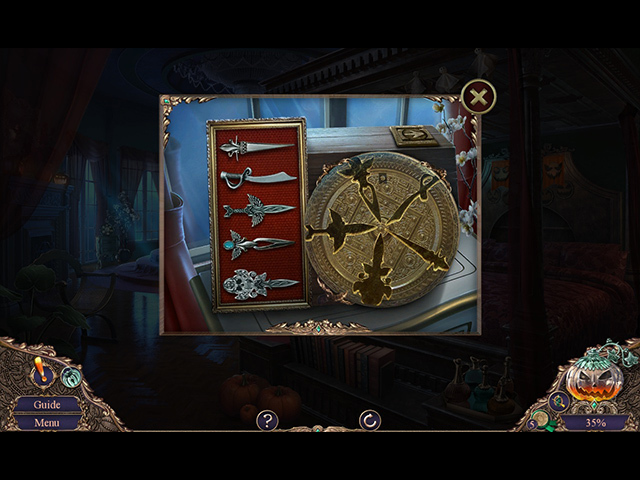 I play HOPA games because I love hidden objects but what I dislike about finding those objects is when they are hidden in the dark and are extremely tiny as is the case with Halloween’s Uninvited Guest. I only got through the last HOS in the game by using the hint over and over and over again. It was tedious and grueling to say the least. Although the developer did make a stab at creativity with the design of the HOPS, the actual scenes were terrible. With the exception of maybe two Puzzles in the demo I skipped most of them because I either disliked the type of puzzle or didn’t want to chew up demo time trying to solve them. That being said, the Puzzles were far better than the HOPS but still nothing new. We have the “fight” scene with different window dressing but it is still the type of puzzle that I dislike. I think my favorite puzzle in the demo is the one where we need to change the pressure on gauges to move a ball to the end of a maze. If you have read some of my earlier reviews you know that I own almost every CE game released by BFG. However, in the past year I have skipped several of the CE releases because I have disliked the games. Unfortunately, many of those games are from this development studio that I once considered my favorite. Games from EIPIX no longer enchant me and quite frankly I find them rather boring. Their HOS have been designed with the idea that making the objects invisible will make a HOS seem more difficult which is true but it also makes them far less enjoyable in the end. With all of the Halloween themed games that we have seen this past six weeks, Halloweens Uninvited Guest is at the bottom of the barrel and is not for me. As always I recommend that you try the demo to see if this is a game you will enjoy. Happy gaming! 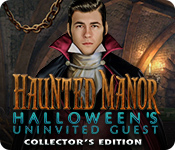 Rated 1 out of 5 by fxrjoe from Where have all the writers gone and what have you done to Haunted Manor!? Haunted Manor one and two are some of my favorite games ever made by Big Fish. I was super excited for this one especially after the last attempt that fell pretty flat in Haunted Manor Three. I hoped the developers would return to one and two's beautiful artwork and excellent storyline, but they did not. This looks like they popped it out really fast without any regard to making it a solid HOG. I need a good story for a game to be good. And recently it feels like that has been vanishing. Please bring back the writers!!!! So, on to this game- I generally like Eipix games, and I could see their expert programming and design in this. They had similar characters and set up as their other non scary games, unfortunately. The game play is alright, pretty boring but ok. Same games as we usually see with a few cool HOGs. But more than anything, the storyline is terrible! The supposed Halloween atmosphere non existent. It felt like I was playing a drama not a scary Halloween game. And not only is this game completely unlike the original Haunted Manors, various renderings are used from their other games. They even used the same music from Phantasmat. I don't know about anyone else, but the music makes a big difference for me in how playable the game is. When the same music is used, it kind of throws me off and I ended up playing Phantasmat after being disappointed by this game. If you are looking for a good Halloween game, check out the Halloween game called The Invitation, Haunted Manor Two, True Fear (one of the best games ever), Haunted Hotel, or any Phantasmat game. Save your money if you want spooky! And save your money if you want a unique and well done game. Rated 1 out of 5 by sabrina_jo32 from Too much talking! I hated every second of this trial. There was entirely too much reading, I had no idea what was going on. 15 min in I deleted it. Rated 1 out of 5 by LunaNik from I am uninviting this game from my computer. It seems as if this game was made because Eipix thought they should release a Halloween game. And that was the last thought that went into this game. They just dug into previously coded subroutines and renderings, heaped them in a pile, and connected them with duct tape, then called it a new game. Logic fails were too numerous to list. I'm unsure why I require a map of my own house, or why I need my hand held to set a dinner table, decorate for a holiday, and choose a costume. I've no idea why the table was set for a dozen when there are only six of us. Or why the housekeeper would ask me to fetch her a dustpan. HO scenes were pro forma and completed in less than 30 seconds because nothing was hidden. I wish I knew why modern devs seem unable to grasp the concept of hidden objects. I've been playing some HOPAs from 2012 and earlier, and the HO scenes take anywhere from 5-15 minutes to complete. Mini-games were silly, easy, and boring. Choosing carpet and drape colors isn't my idea of a puzzle. Neither is virtually trying on dresses. I'll bet any amount of money you care to name that there will be jigsaw puzzles and matching pairs, which are puzzles for children. Other than that, each scene was overflowing with shaped indentations awaiting matching medallions, bas reliefs, and the like. Really original, Eipix...not. The graphics were ok, but the characters weren't animated; they just disappeared then reappeared in a new position. The music wasn't the creepy, goosebump-raising type you expect in a Halloween game. And the voiceovers either lacked affect or were melodramatic. I lasted 19 minutes before conceding, yet again, that I was uninterested in a game with no actual gaming in it. Eipix, your formula isn't working; go back to the drawing board. Rated 1 out of 5 by cathybobcat from CONVOLUTED...BACK AND FORTH....I NEED DRAMAMINE The gameplay is atrocious in this. I could not even finish the demo. There is so much back and forth....so many things need inventory....and I don't have what is needed....so I have to go searching back and forth, around and around until I am utterly dizzy and sick to my stomach, not giving a you know what anymore because it is nothing but TORTURE. I started using hints just to know where to go and what to do because I was tired of trudging through this mess. Adding to the nausea is excessive fog and haze in practically every scene. It was even overdone in the bathroom scene. I value my eye sight....speaking of which, there is a hos with a pumpkin you have to turn to find items and most everything is in the dark. I rarely take hints in a hos, but this one, I had to take so many because I could not see. Are they trying to make us go blind??? It is a total shame about this because the game does have atmosphere and potential. I really wanted to like this, but it was ruined by the excessive inventory needed in so many scenes and the difficulty in finding everything needed, and then remembering where everything has to go. I don't play a game to get worn out and if that is what a demo does, I do not have the energy nor the desire to finish the game. Going around in circles is the gist of this game. It is far from being enjoyable...and is more a trick than a treat for Halloween. Rated 1 out of 5 by breantrose from Aggravating. This is one of those games that stop you from taking a look around at a scene until you do exactly as the game suggests you do. You can't grab items, or click on morphing objects, or collectibles, until you follow the story line to the letter. This is extremely aggravating. You are forced to switch Halloween costumes with your sister, whether you want to or not. Lol I barely made it through any more of this game before exiting. Awful. None of the scene decorations move or interact when clicked on, which suggests detail was not used, like most great games are done nowadays. Bottom line: Don't force players to do your bidding when all you want to do is look around a scene first. You are stopped from doing anything else inside the game, until you've done what the game wants first. Rated 1 out of 5 by Krissy41 from Boring!! Slow!! Alot of Back and Forth!! This looked good when I first started playing it BUT OMG was it boring!! Alot of back and forth to get an object and storyline was just plan bad! The graphics on some of the HO scenes was decent but that was all I could say. I did play the entire demo which was not easy to do! Try it for yourself you might like it but I doubt it!